Strength in numbers appears to be the maxim leading to the creation of the tentatively-named Chinese Bus Importers Association. with support from Peninsula Motor Group Managing Director Dilip Kumar, the new association is expected to be ratified in November. 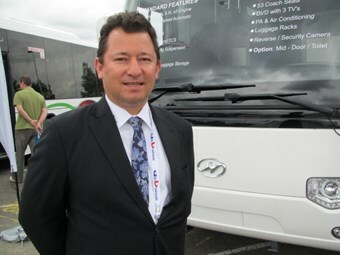 Pecotic says the appearance of Bonluck, Zhong Tong, and Yutong, joining established imports King Long, BCI, and Higer, means there has been a significant increase in Chinese made buses coming to Australia in the past three years. And while market acceptance has been positive among private operators, particularly in the school and charter market, Pecotic is ‘irritated’ by what he perceives as protectionist policies locking Chinese bus importers out of key Government-controlled urban markets. "Each of us has an issue regarding (low floor) city buses," Pecotic says. "We believe we should all be given an equal chance to supply city buses to government." Part of the Association’s agenda will be to lobby state Australian governments to have the Chinese range of buses ‘looked at’. "We are about 40 percent cheaper than the local manufacturers, however we are not looked at – and that’s something that has irritated me for the last couple of years," Pecotic says. "We pass ADR (Australian Design Rules), so the safety standards are there and the quality is there." Pecotic believes his Higer low floor city buses could save the NSW Government about $200,000 per bus, equating to several millions of dollars each year. "Yutong and Higer are the largest bus manufacturers in the world and they know how to make city buses," he says. "We want our buses looked at on merit and on quality against the Australian-made buses." Pecotic says he is ‘appalled’ at what operators are prepared to pay for low floor buses. "I have been to the bus show in Melbourne and I can save the operator 40 percent off a city bus and offer a better product," he says. Pecotic has enlisted the support of Dilip Kumar who is a recent entrant to the bus industry, but a seasoned veteran of the motor industry having built a large Holden dealership in Sydney, and now bringing China’s largest bus manufacturer – Yutong – to Australia. "Dilip Kumar is a very well respected person in the business community, and having Dilip on side is key to helping us push for governments to look at us," Pecotic says. Kumar and Pecotic both feel strongly about the need for a new association. Kumar says now that Chinese importers are ‘doing serious numbers’ of Chinese-built buses in Australia, this collective of suppliers should be heard. "Jason and I have had long chats about it and we think it’s very important to form this body and lobby government to give us a chance to get into that highly protected sector," Kumar says. "When new regulations come out we want to be at the coal face and have some input – and it’s far better doing this as a group," he says. Pecotic sees no advantage in taking the concerns of Chinese bus importers through established groups such as the Bus Industry Confederation’s Suppliers Committee. "What advantage have they got to support a Chinese city bus – there’s no advantage," Pecotic says. "And if you look at where Chinese buses have come in four years, they have come a long way." A meeting to establish the association is scheduled for the end of October.